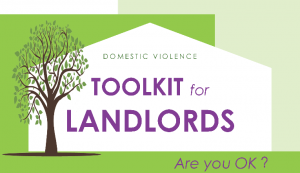 The Centre for Public Legal Education Alberta has developed the Domestic Violence: Toolkit for Landlords. The online resource is designed for landlords, property managers and anyone else who works on-site or has access to residential rental units. It will help landlords to understand the role they can play in preventing domestic violence on their premises. It also provides basic information on dealing with domestic violence when it does occur. ← RESEARCH | What strategies prevent tenant evictions?